In New York, $18 will buy you five 40s of Olde English, three Shake Shack burgers, 18 Poland Spring water bottles, or a single cup of filter coffee from Industry City's Alpha Dominche Extraction Lab -- a gourmet cafe that opened inside Sunset Park’s multipurpose industrial complex this year. The coffee currently stands as the most expensive cup in the country, with Blue Bottle's $16 blend following as a close second. But who, exactly, is willing to pay that much for filter coffee, when most New Yorkers already bemoan the need to pay nearly five bucks for a La Colombe latte? And more importantly, what justifies the $18 price tag? On a recent Monday morning, I headed out to the Extraction Lab, which offers coffee tastings and a rotating selection of five separate roasts, in a space that is best described as zen garden-meets-Dexter's Laboratory. 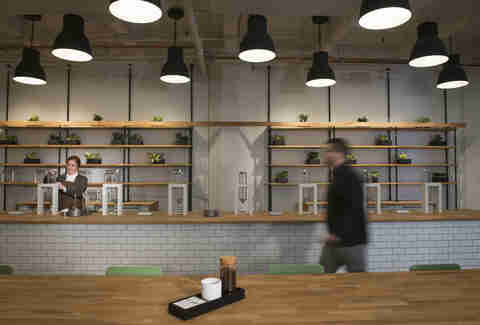 The walls are lined with plant-studded wooden shelves, coffee beans are stored in racks of plastic test tubes behind the register, and the bar is topped with rows of towering glass Steampunk brewers, each of which is paired with an iPad control panel. And while milk and sugar are available on a table tucked in a back corner, it seems that diluting your coffee here is about as respectable as mixing wine with seltzer at a tasting. So... why is it so expensive? The hardcover coffee bibles stacked on the cafe's work tables will tell you that the cost has to do with an extensive, labor-intensive sourcing and roasting process: Coffee cherries are handpicked on Panamanian farms according to ripeness (rather than harvested en masse for large-scale production) before undergoing a far more delicate roasting process than, say, the ultra-dark roasts served at Starbucks. Alpha Dominiche CEO, former Bodum executive, and international coffee connoisseur Thomas Perez, argues that $18 is not actually a particularly large sum of money when it comes to luxury products. He claims that if the process of harvesting, roasting, and brewing a perfect cup of coffee rivals the methods employed by wineries and chocolatiers, then $18 no longer seems like quite so large a number. The coffee was really just "an $18 Instagram." Who the hell is spending $18 on coffee? The Extraction Lab was not particularly crowded the morning I arrived, and the vast majority of the scattered customers told me they had made the trek to Industry City purely to sample the coffee. The consensus among them was fairly unanimous. You'd pay $18 for a cup of filter coffee for the same reason you might pay $15 for a milkshake at Black Tap: the hype. One customer, visiting from New England, cited the place as a tourist attraction, while another said he had come for "dinner party insight." A particularly vocal customer argued that the coffee was really just "an $18 Instagram," after taking what seemed like several hundred photos of his glass (without actually taking a sip), and the girl to his left explained she had come after seeing a series of Facebook posts raving about it. Not one customer commented on the actual quality of the beverage itself. Will Broth Cafes Become the New NYC Coffee Shops? All hype aside, the coffee was good. The barista walked me through each step of the brewing process, carefully grinding a test tube of the famous Ninety Plus Gesha Estates Panamanian beans, before lowering the grinds into the body of a Steampunk, and plugging the weight and origin of the blend into one of the iPads. Within the glass crucible of the machine, steam-heated water slowly infused into the fresh grinds, and after several seconds, jets of the water shot directly into the coffee -- a process the lab calls "full immersion." Having spent my fair share of time serving coffee, this was unlike anything I had previously witnessed. Even in the era of cold brew and pour overs, it was by far the most complex filter coffee-brewing system I had ever seen. The bar offers no espresso, no ice, no milk steamers -- just coffee, in its purest form. The blend tasted like citrus, dark chocolate, and jasmine. Unlike most black coffees, it didn't leave even a hint of a bitter aftertaste. There were no grinds resting at the bottom of the glass. I found myself cycling through the glossary of terms I'd collected from the backs of wine bottles to describe the taste -- oaky, full-bodied, tart. Perez was not wrong, it was certainly a luxury product. 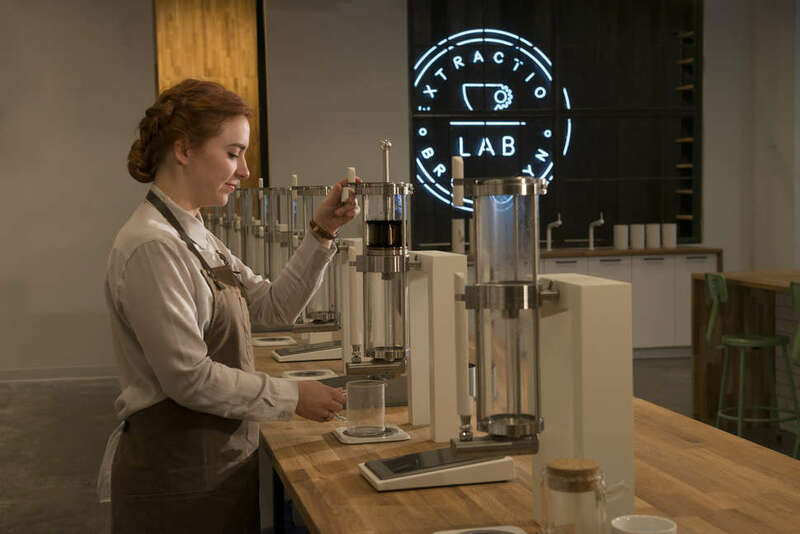 But while the Extraction Lab offers an experience, along with some truly excellent coffee, it's hard to imagine it will ever cater to a culture of regulars. Coffee shop etiquette, for the most part, demands familiarity -- a barista who knows your order, who acknowledges when you get your hair cut. This coffee may be a luxury product, but it's unlikely that customers will make a routine out of near-$20 drip coffee. For most of us, coffee is a prosaic, every-day affair -- it need not be New York's finest. In spite of its excellence, it remains to be seen if a coffee vendor can thrive serving high-end craft brews at this price once the hype dies down. On the other hand, if New Yorkers are willing to buy a 24-karat gold pizza, then perhaps luxury coffee is not so far a reach. Eliza Dumais is both a writer and a terrible barista.